What a lovely evening we had last Sunday at the party for those involved in the Passion. It was good to have a gathering of so many people from different Churches in the town. The Church Fete is being held on the 10th June and I hope a lot of children will come along to the face painting and other activities that are on offer. I hope that Mary-Jane’s operation will go well and she will have a speedy recovery. While she is away I will be taking some of the Vestry Group sessions on a Sunday. I will be completing my first year at the University of St Mark and St John. I have really enjoyed this and look forward to next year. My placement this year has been in Cornwall and I await to hear where my placement will be next year. I would like to thank the members of the congregation who have been interested in my progress. To anyone taking exams this month I wish you every success. What a tremendous lead up and celebration at Easter we had in Tavistock this year! On Good Friday Tavistock held its first Passion Play since 1958, when my Grandmother was one of the crowd. Mum, Lily and I were asked by Sarah and Steve if we would do the make-up for the Passion Play. Sarah took Lily and me to Saltash to be given some training, in particular for bruising and bleeding. This was a new experience! After lots of practice (mostly on each other) we were ready for the big day. We really enjoyed this opportunity and would love to do it again! As my Dad took an acting part in the Passion Play I thought I would ask him some questions about it to share with you all. What is the Passion Play? The best way of describing the Passion Play is that it is the story of Jesus’s crucifixion and resurrection told by the Churches in Tavistock and the surrounding villages. It was performed in Tavistock to show ordinary people living ordinary lives the outstanding story of Jesus’s triumph over death. I was helping at a Messy Church session on a Saturday when Steve the Curate asked for my email address so I could be part of the Passion Play. I was a shepherd at Christmas Eve again this year which I thoroughly enjoy so I thought it would be a wonderful experience for me to get involved in another Church event. Ever since Steve got my email address I have been attending most rehearsals in the Parish Centre and St Eustachius’ where I was given a part in the play. What part did you play and why? What did you enjoy about the Passion Play? Overall, I enjoyed everything about the Passion Play because I got to make new friends, learn more about the Easter story, spread the word about Jesus and see the impact the Passion Play had on the community. The number of people who turned up was amazing which made all the arduous work of the play worthwhile. How was the Passion Play organised? There were a lot of complex notes in many notebooks, emails and texts that went into planning and making this play tick. We were very privileged to have David Stranks, Sarah Pendle, Steve Martin and many other helpers to organise the Passion Play and the rehearsals. We have a makeup team and a brilliant costume team which helped to make the play come alive. The crosses themselves were fantastically made by Eric and his son, Mark. Moreover, we had amazing advertising which helped to draw in audiences from a vast area. The backstage team helped to keep the play together as one big performance as they told us actors where to go and when. What were you most concerned about for the performance? I was most concerned about the sound as we couldn’t practise it before-hand but luckily it went well and the performance was heard all around the town. Personally, I was worried about scene seven because it was a complex one. We had many props and cues to move in and out the doors of the Magistrates Court. We had to practise this scene a lot but luckily it went perfectly well on the day. I would love to take part in a Passion Play or something similar again as I learned a lot and made some great friends in this experience. I was very proud that all my family could take part in this poignant event. Overall, the Passion Play was an immense success and I loved every moment of it. I will cherish memories of all the stress we went through before the play and all the liberation we all felt afterwards. I am now looking forward to the celebration coming up for all those involved which is taking place in May. I will write to you all again next month when we will be halfway through the year! By the time you read this page, the clocks will have changed and the days will be getting longer. April is a month when everything comes to life and this brings great joy. On Saturday 25th March members of the Vestry Group, with their Dads, made posies to be distributed among the congregation on Mothering Sunday. This brings happiness to all the ladies in the Church. On Mothering Sunday the Messy Church team gave a presentation to the congregation on the wonderful work they do! A lot of significant events are celebrated this month which all lead up to Easter. Maundy Thursday is an important day for remembering the last supper. It is a time to reflect on how Jesus would have felt, knowing he was going to die. Good Friday is a morbid day when we remember Jesus dying on the cross and God sacrificing his only son for us. 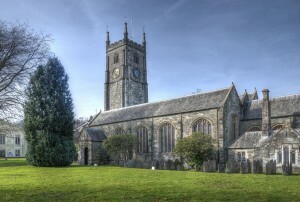 This year we will have the opportunity to watch the Tavistock Passion which will remind us of the events that happened. Easter Sunday is many Christian’s favourite time of the year because it a celebration of when Jesus rose from the dead. What is your favourite part of Easter? I thought it would be a lovely idea to include a Easter word search for you all to complete during the Easter period. I would like to wish everyone a Happy Easter full of joy and maybe even some chocolate! We have entered the month of March which means Easter Day is approaching! The word ‘March’ comes from the Roman ‘Martius’. This was originally the first month of the Roman calendar and was named after Mars, the god of war. We changed to the ‘New Style’ or Gregorian calendar in 1752, and it is only since then that the year begins on 1st January. We are now in the season of Lent. One of the flowers associated with this is the narcissus (wild daffodil). Narcissus is also known as Lent Lily because it blooms in early spring with the flowers usually dropping before Easter. On the 26th March it is Mothering Sunday. No one is absolutely certain when Mothering Sunday began. However it has been argued that it could have been adopted from a Roman Spring festival celebrating Cybele, their Mother Goddess. It is known that on this date, about four hundred years ago, people made a point of visiting their nearest big Church (the Mother Church), the Church in which each person was baptised. Young British girls and boys ‘in service’ (maids and servants) at the local Manor House or in a Mansion, were only allowed one day to visit their family each year. This was usually on Mothering Sunday. For some this could be a significant journey since their Mothers may have lived some distance away, indeed in another town altogether from the places where they were put in to service. Often the housekeeper or cook would allow the maids to bake a cake to take home for their Mother. Sometimes gifts of eggs or flowers from the garden was allowed. Two days before you intend to make the cake place the sultanas, currants and mixed peel in a bowl with the lemon juice, brandy and orange juice, mixing it well and leaving to one side for the fruit to soak up the liquid. This will produce a much moister cake when baked, but can be omitted. Pre-heat the oven to 150C/Gas 2. Line the base and sides of a 20cm deep round tin with silicone paper. Measure the rest of the cake ingredients in with the fruit and beat well until thoroughly mixed. Put half of this mixture in the bottom of the cake tin and level it off so that it is as flat as possible. Divide the marzipan into three equal parts and roll out one piece into a circle 20cm diameter, and put it on the top of the cake mixture. Gently spoon on the rest of the mixture, levelling the surface again. Bake for approximately 2 ½ hours until brown, well risen and firm to touch. Allow to cool for 15 mins and then turn out to cool on a wire rack. When the cake is cool, warm up the apricot jam in a small saucepan and brush the top of the cake with it. Roll out half of the remaining marzipan to the size of the top of the cake. Press it down firmly and push the edges down with your thumb to crimp it round the sides. Roll the rest of the marzipan into eleven balls to represent the Apostles, without Judas. Brush the top of the marzipan with the beaten egg and place the balls evenly around the outside, brushing the tops of the balls as well. Place the whole cake under a hot grill until the marzipan turns a light golden colour. Lent is not only about giving things up but maybe trying to do something extra for someone else. By the time you read this page January will have been and gone and we are now in the shortest month of the year. Hopefully it will not be long before we see the first signs of spring and February’s flower is the primrose. On the 2nd February it is Candlemas Day. This ancient festival marks the midpoint of winter, halfway between the shortest day and the spring equinox. In olden times, many people used to say that the Christmas season lasted for forty days – until the second of February. It was the day of the year when all the candles, that were going to be used in the church during the coming year, were brought into church and a blessing was said over them – so it was the Festival Day of the Candles. Candles were important in those days not only because there was no electricity but some people thought they gave protection against the plague, illness and famine. For Christians, they were (and still are) a reminder of something even more important. Candles are lit during church services to remind us that Jesus is ‘the light of the World’. On Tuesday 28th February it is Shrove Tuesday (Pancake Day). This is the last day before Lent. In Greece, Shrove Tuesday is called Aprocreas, which means “from the meat” since they do not eat meat during Lent either. In Iceland, the day is known as “Sprengidagur”, which means bursting day.